Eleven-year-olds who have tried cigarettes or alcohol show signs of switching off from school and are more likely to get into trouble, according to findings from the Millennium Cohort Study (MCS). Researchers from Pennsylvania State University analysed information from more than 13,000 children born across the UK in 2000-01 who are taking part in MCS. When the children were aged 11, they were asked confidentially whether they had tried a cigarette, even if only a single puff, or had more than a few sips of an alcoholic drink. Only 3 per cent of 11-year-olds had had a cigarette, and 13 per cent had tried alcohol. At ages 7 and 11, the children were asked whether they liked their school work, whether they found it interesting, or felt school was a waste of time. They were also asked how often they felt happy, sad or angry at these ages. The researchers compared children who had similar risks for early substance use, such as having parents who smoked. The children who did end up trying cigarettes or alcohol by age 11 had notably lower wellbeing and engagement with school. Early substance use did not appear to affect their academic attainment at this age. 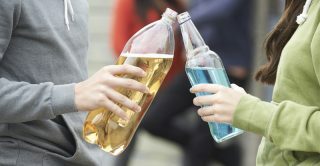 However, the researchers said they might do less well during teenage years, for example if their substance use leads them to fall in with the wrong crowds. Children regarded by their parents as hyperactive or inattentive were also more likely to have smoked or drank by age 11, as were boys and white children. Children were less likely to smoke or drink early if their parents were highly educated and did not smoke or drink themselves. Other research has shown that children who start smoking or drinking early in life have a higher risk of later addiction, as well as failing at school, committing a crime or getting injured. ‘Childhood cigarette and alcohol use: negative links with adjustment’ by Jeremy Staff et al. was published in Addictive Behaviors in November 2016.